Prof. Gerald G. Goeringer "..this description antedates by many centuries the recording of .. traditional scientific literature." �In a relatively few ayahs (Quranic verses) is contained a rather comprehensive description of human development from the time of commingling of the gametes through organogenesis. No such distinct and complete record of human development, such as classification, terminology, and description, existed previously. In most, if not all, instances, this description antedates by many centuries the recording of the various stages of human embryonic and fetal development recorded in the traditional scientific literature." Prof. William W. Hey "I would think it must be [from] the divine being." Prof. T. V. N. Persaud "..this is a divine inspiration or revelation.."
Prof. E. Marshall Johnson "I see nothing in conflict that ...divine intervention was involved." [Summary] "The Quran describes not only the development of external form, but emphasizes also the internal stages, the stages inside the embryo, of its creation and development, emphasizing major events recognized by contemporary science." Prof. Alfred Kroner "Someone 1400 years ago could not know the heavens and the earth had the same origin.."
"Thinking about many of these questions and thinking where Muhammad came from, he was after all a Bedouin. I think it is almost impossible that he could have known about things like the common origin of the universe, because scientists have only found out within the last few years with very complicated and advanced technological methods that this is the case." He also said: "Somebody who did not know something about nuclear physics 1400 years ago could not, I think, be in a position to find out from his own mind for instance that the earth and the heavens had the same origin, or many others of the questions that we have discussed here." Prof. Keith Moore "It is clear to me that these statements must have come to Muhammad from God or Allah.."
Keith L. Moore is a professor emeritus in the division of anatomy (department of surgery), former Chair of anatomy and associate dean for Basic Medical Sciences (Faculty of Medicine) at the University of Toronto, Ontario, Canada. He has also worked at the King Abdulaziz University in Jeddah, Saudi Arabia. He is most known for his textbooks on the subjects of anatomy and human embryology. "It has been a great pleasure for me to help clarify statements in the Quran about human development. It is clear to me that these statements must have come to Muhammad from God, or Allah, because most of this knowledge was not discovered until many centuries later. This proves to me that Muhammad must have been a messenger of God or Allah". 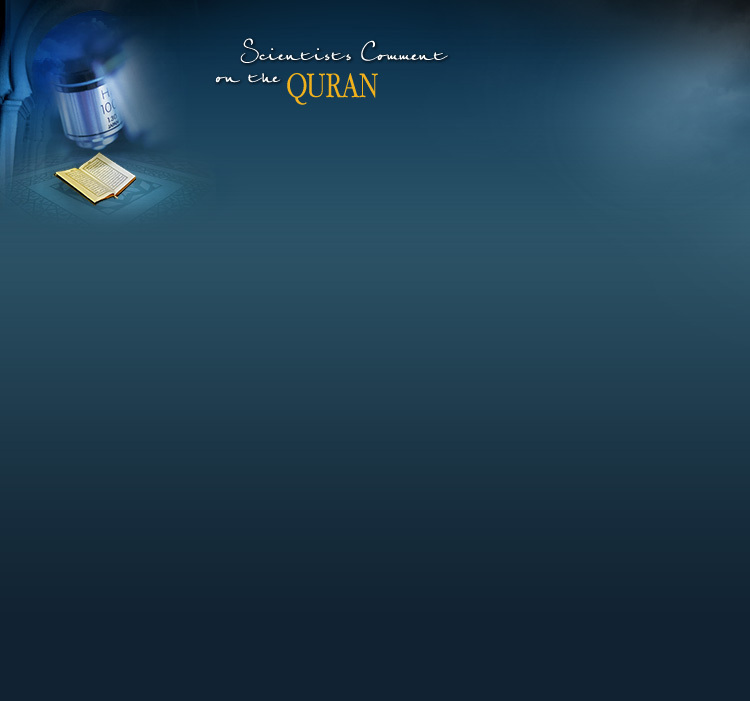 Prof. Yoshihide Kozai �I am very much impressed by finding true astronomical facts in Quran." Prof. Tejatat Tejasen* "I believe that everything that has been recorded in the Quran 1400 years ago must be the truth, that can be proved by the scientific means." He Makes Shahadah!